This song makes heavy use of the Forward - Backward roll--though it is often modified by playing the 4th string to bring out certain melody notes. 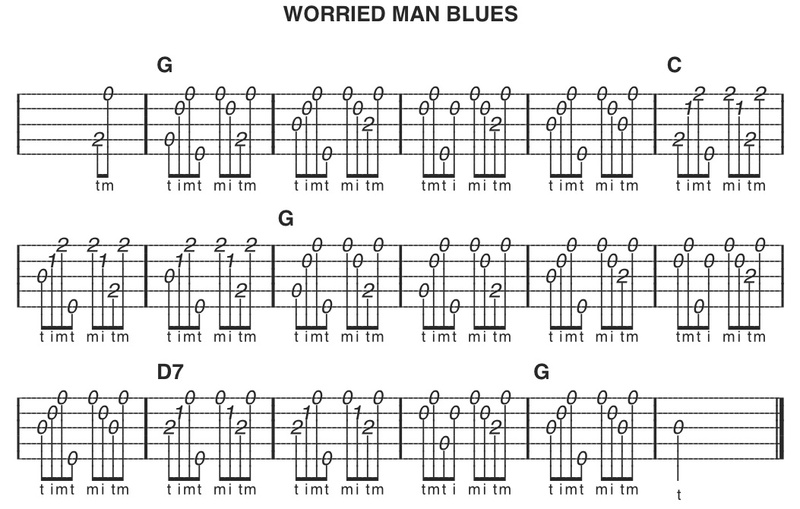 The last D7 measures near the end of the song are played by holding a D7 chord while playing the basic Forward - Backward roll. The letters shown above the measures tell you what chord the band would play behind you as you pick the lead. They can also give you clues (sometimes) as to what chord shapes you might be partially holding down as you pick lead. For example, measure 6 (where the C chord begins) coincidentally requires you to hold a C chord shape for 3 measures. At other times, such as on the G measures, you play notes and don't really hold a "G chord" at all. If that makes no sense to you don't worry. Just take it note by note, keep 'er steady and have fun. It will all make sense later. By the way, this was the first complete tune I ever learned to pick on the banjo and is still the only song which I can sing lead to while I play the upright bass. 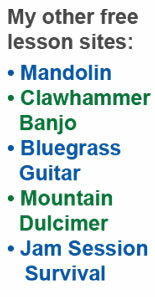 All of my banjo books are downloadable eBooks. Get 'em today!